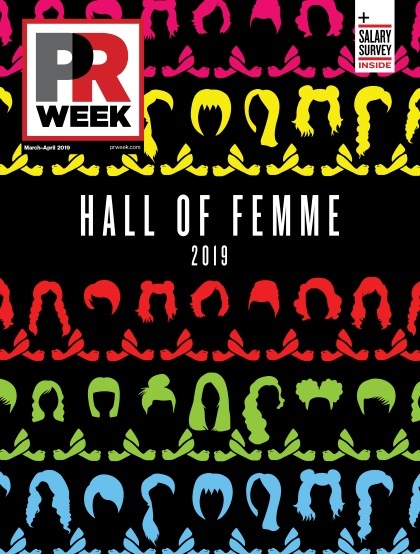 PRWeek Hall of Femme: The fourth class of inductees features 13 talented women who pave the way for future generations in the comms industry. This year’s Women to Watch list has 28 rising stars that are creating innovative work in PR. PRWeek Awards: The Oscars of the PR industry celebrated groundbreaking work, featuring four 20th anniversary awards, on March 21 at Cipriani Wall Street in New York City. PRWeek/Bloom, Gross & Associates Salary Survey: A shrinking gender pay gap and positive movement on flex time are two factors that have fueled an increase in salaries and decrease in company departures. Newsmaker: The National Park Foundation’s chief of external affairs Robert Mathias details his challenges in the aftermath of the government shutdown. CMO feature: Burger King global CMO Fernando Machado believes creativity gives a competitive edge in the fast-food industry.